Martin Denny was born April 10, 1911 in New York City. A child prodigy, at age ten he studied piano under Lester Spitz and Isadore Gorn. For four years he toured South America with the Don Dean Orchestra, followed by a 43-month stint in the U.S. Air Force during World War II. Following his December 1945 discharge, Denny settled in Los Angeles, studying piano, composition, and orchestration at the Los Angeles Conservatory of Music. In early 1954 he relocated to Hawaii, contracting to appear at the Honolulu club Don the Beachcomber's. The following year Denny formed his own group, originally consisting of vibist Arthur Lyman, bassist John Kramer, and percussionist Augie Col&#243;n. In 1956, while appearing at steel and shipping magnate Henry Kaiser's Shell Bar — a club inside the open-air Oahu resort Hawaiian Village, complete with a small pond adjacent to the stage — the combo realized that the croaking of nearby bullfrogs blended perfectly with their tropical musical approach. On a lark, Col&#243;n also began imitating bird calls on-stage, much to the delight of the audience. Denny soon began incorporating South Pacific and Far East instruments into his arrangements as well, and by the time he recorded his Liberty Records debut, 1957's Exotica, his singular sound was firmly in place. The release of Exotica proved perfectly timed — as the '50s drew to a close, tiki culture was all the rage in mainland America, with Hawaiian shirts a fashion trend and tiki torches a staple of backyard parties. Moreover, the evolution from mono to stereo recording and playback had taken root, and with its bird whistles, jungle calls, and far-flung instruments, the many distinctive components of Denny's sound were ideal for channel separation. Originally composed by Les Baxter, the instrumental "Quiet Village" was a massive success, earning Denny and his group an appearance on TV's American Bandstand, and the accompanying Exotica LP topped the Billboard charts. But ironically, even as his music came to embody Hawaiian culture and its mythical allure, Denny himself was no longer a fixture of the island musical culture — after a bitter contract dispute with Kaiser, he brought his group stateside, and they made their first mainland appearance at the 1957 Pebble Beach Crosby Open golf tournament party. Soon after, Kaiser lured Lyman back to Hawaii to assume Denny's vacated spot headlining the Shell Bar; Denny replaced him with Julius Wechter. Likewise, Kramer was later replaced by Harvey Ragsdale, and a second percussionist, Harold Chang, was also added the lineup. For many listeners, the exotica craze proved short-lived, and Denny never again matched the success of "Quiet Village," although subsequent singles including "A Taste of Honey," "The Enchanted Sea" and "Ebb Tide" did find some favor on the pop charts. For connoisseurs, however, the story certainly does not end there. Denny continued making records in his trademark style throughout the '60s, many of them housed in eye-popping sleeves featuring model Sandy Warner, who was such a ubiquitous presence that she was even dubbed "The Exotica Girl." (Warner eventually recorded her own LP, Fair and Warmer, with Denny himself authoring the liner notes.) While his interests in African and Pacific Rim musical traditions yielded concept records like Afro-Desia and Sayonara, other efforts turned towards more conventional easy listening, which Liberty dubbed his "honey" sound. For the most part, however, Denny remained a restless innovator. For Primitiva, he recorded using a number of gongs, drums, and odd brass instruments acquired from a Buddhist mountaintop temple in Burma by friend and filmmaker John Sturges, on location to shoot the Frank Sinatra vehicle None But the Brave. (According to legend, the instruments were then carried down the mountain by a procession of Buddhist monks.) For 1969's Exotic Moog, his Liberty swan song, Denny even embraced electronics, much to the chagrin of his dwindling fan base. With his recording career largely behind him, Denny maintained a busy touring schedule throughout the '70s and into the following decade. In 1985 he announced his retirement, settling in Hawaii with his longtime wife June, but three years later he grew restless, reuniting with Lyman, Col&#243;n, Chang, and adding bassist Archie Grant to return for a series of sold-out club dates. 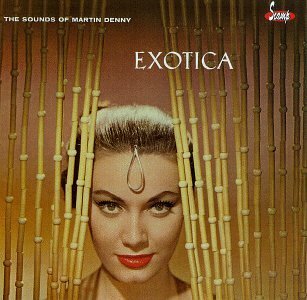 A Japanese tour yielded the live recording Exotica: The Best of Martin Denny. As the new decade began, he was the recipient of the Hawaiian Association of Music's Hoku Award for lifetime achievement; the honor coincided with the beginnings of an exotica/space age pop revival, and virtually overnight Denny's vintage LPs began disappearing from used record stores. He was also the subject a major CD reissue campaign on the Scamp label. Now a music icon for a new generation, Denny again returned to the road, making live appearances even into the 2000s. His last concert was held in Hawaii on February 13, 2005 at a benefit to aid tsunami victims. Just three weeks later on March 3, 2005 Martin Denny, icon and innovator, passed away at the age of 93. Remember! The quality of this recording is not probably the clearest one because it was made from the oridginal vinyl. But a few cracks make this recording sound pretty nice!